ERBIL, 9 July 2014 (IRIN) - “The sound of the shelling was terrifying. In my street no-one was left. 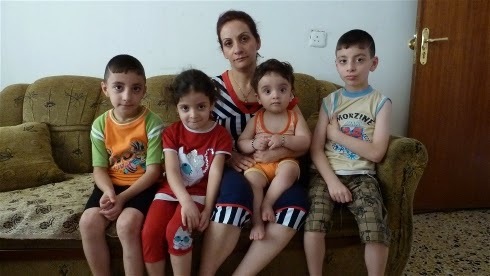 We were the last family to leave,” explained Janda, an Assyrian Christian from Iraq. Her family of six fled the town of Qaragosh (also known as Bakhida and Hamdaniya) 30km east of Mosul, in northern Iraq, leaving their home in the middle of the night. Travelling by car, they crossed into the capital of semi-autonomous Kurdistan, where they sought shelter in a sports hall in the mostly-Christian district of Ainkawa, in the Kurdish capital Erbil. Janda is one of an estimated 10,000 Christians who fled from the Nineveh Plain - the region to the north and east of Mosul - to Erbil in the space of days in late June to escape militants from the Islamic State of Iraq and the Levant (ISIS) and their clashes with Kurdish armed forces (Peshmerga). The aerial bombing campaign of the Iraqi Security Forces against ISIS has added to the concern. “We are scared because we have heard rumours that ISIS decapitates people,” said Ammar, another Christian, who also left Qaragosh with his wife Iman and their two children, and found refuge in a cramped hall. “What happened to Christians in Syria - we expect the same fate,” he added. In recent months reports have come out of Syria of churches being burned and Christian communities being attacked and forced to convert to Islam. While not all of them are true, they have stoked deep fear in the Iraqi Christian community. So far there has been only minor damage to churches inside Mosul - a statue of the Virgin Mary removed and some black ISIS flags hung in place of crosses - though last week two nuns and three orphans went missing, feared kidnapped. ISIS began its military offensive into northern Iraq in early June, seizing control of large sections of the provinces of Nineveh, Salaheddin and Kirkuk, to add to the swathes of Anbar Province it has held since the turn of the year. On 29 July, it declared the formation of an Islamic caliphate. Although people of all faiths and ethnicities are among the 1.2 million people who have been displaced since January, rights groups warn that Christians - along with Iraq’s other religious minorities such as Shabak, Turkomans, and Yazidis - are particularly vulnerable to ISIS and also to any political and geographical splits in the country that may come about in the future. “A clear pattern is emerging whereby ISIS is deliberately targeting Iraq’s minorities as well as others suspected of opposing the group, singling them out for detention and abduction,” explained Donatella Rovera, Amnesty International’s senior crisis response adviser, currently in northern Iraq. Letta Tayler, senior terrorism and counter-terrorism researcher at Human Rights Watch (HRW), agreed that while atrocities were “happening on all sides”, minorities were being “singled out” by ISIS, which follows strict Sunni Muslim ideals. “Religious minorities are doubly targeted; they are victims of both the general fighting and attacks because of their beliefs,” she said. “This has been a traditional pattern in Iraq, but during conflict it increases and these people are panicked. Right now we are seeing an acceleration of a slow-motion mass displacement of religious minorities,” she added. These attacks are likely to increase a trend for Christian migration: Before the US-led invasion in 2003 there were an estimated 1.3 million Christians living in Iraq, but now there are believed to be as few as 300,000. This has been largely due to increased violence, including a 2010 attack on Our Lady of the Salvation Church in Baghdad, which killed 58 people. Zaid Al-Ali, an Iraqi lawyer and the author of The Struggle for Iraq’s Future, said that although Christians were not part of Sunni versus Shia sectarianism, or necessarily targeted because of their religion, during the 2006-2007 surge in violence, when sectarian labels were attached to threats, extortion and kidnapping, Christians were particularly affected. In the past week, many of the Christians who fled to Ainkawa from Qaragosh have gone back home, according to church leaders. The bombs have stopped for now, but coupled with the difficult conditions due to the lack of water, fuel and electricity, there is also a deep uncertainty about what the future may hold, with ISIS showing no sign of giving up territory it has seized. Christians are not the only minority to fear the advance of ISIS: there have been various reports of attacks on Shabak villages; and Turkomans, Iraq’s long-persecuted third largest ethnic group, are also being targeted by the insurgents. Turkomans Front official Aydin Maroof told local media on 6 July that 200 Turkomans have been killed and 200,000 displaced as a result of ISIS attacks in Nineveh and Kirkuk. According to HRW, on 23 June, ISIS raided the villages of Guba and Shireekhan, close to Mosul and home to Shia Turkomans. Homes and farms were ransacked, four Shia places of worship were blown up, and some 950 Turkoman families were forced out of the area. Other Turkoman places of worship have also been attacked in Tal Afar, 50km west of Mosul, HRW said. “It is a kind of genocide against Turkomans and against other people of Iraq,” Ali Bayatli, from Kirkuk, and the head of the Association of Turkoman Lawyers in Iraq, told IRIN. In Bashiqa, a mixed Yezidi and Shabak village about 22km northeast of Mosul, Hussam Salim, a volunteer programme manager for the Yezidi Solidarity and Fraternity League charity, said people were living in fear of ISIS following the release of video footage by the militants of a group of kidnapped Yezidis. “The Yezidi community here feels very threatened by ISIS policies. They feel hopeless here and many people are either leaving to Europe or talking about leaving,” he explained. Yezidis follow an ancient religion related to the Zoroastrian faith. They worship a deity called the Peacock Angel, who was supposedly cast out of heaven by God, and as a result are often branded devil worshippers. Over the years, Iraq’s Yezidis, who number around 500,000, have faced significant persecution and attacks, but the advance of ISIS poses a new threat, especially given the community’s geographical position in territories long disputed between Kurdistan and Iraq and now on the frontline of ISIS’s so-called caliphate. Despite the chaos, the country’s political elite in Baghdad has shown little sign of negotiating a settlement, with parliament again cancelling sessions on 7 July. Kurdish leaders have, meanwhile, seized the moment to call for separation from the rest of Iraq, and Massoud Barzani, president of Iraq's Kurdistan Region, has said he intends to hold a referendum on independence within months. However, while there is strong support for independence among Kurds in Kurdistan, not all of the minorities living in the disputed territories that the Kurdish Regional Government (KRG) wants to claim wish to be defined as Kurdish. Thirsa de Vries, Iraq senior programme officer for Dutch NGO PAX, said any potential partition added to the vulnerable state of Iraq’s minorities and she called on the international community to “be aware” of local politics which, she said, was “part of larger power plays for land and influence”. “For years, identity politics have been used to manipulate the small minorities living on the Nineveh plain - disputed territory between the KRG and the Iraqi central government,” she said, adding that her organization had received many reports from Shabaks, Yazidis and Christians pressured to affiliate with both sides and in some cases forced to do so in return for protection.